To receive dental implants, you must have sufficient bone tissue and room in your jaw to accommodate the implant posts. If you have sustained bone loss, Dr. Ryan Osinski can perform bone grafting at his Saratoga Springs, NY, practice. During this procedure, he will use your own tissue or a compatible material to rebuild the recessed areas of your jaw. Dr. Osinski has extensive training in oral surgery, and he utilizes state-of-the-art techniques. You can rest assured that My Saratoga Dentist PLLC, is an outstanding choice if you are looking for safe, comfortable, and effective oral surgery. Your dental roots play an essential role in your oral health. These structures keep your teeth fixed in your jaw, but they also send restorative signals to the nearby bone tissue. When you lose teeth, these signals are no longer present, and your jaw will quickly start to recede. Unfortunately, bone loss can compromise your ability to receive dental implants, because the metal posts must receive enough support from the surrounding bone to be successful. Bone loss can also lead to sunken features and uncomfortable prosthetics as your jaw shrinks. 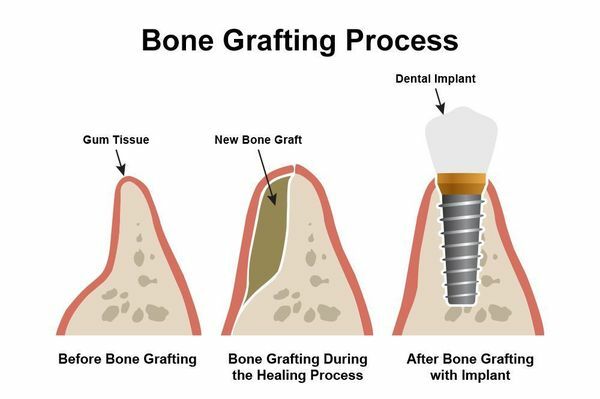 Bone grafting can often restore candidacy for restorative procedures such as dental implants, and can preserve your facial features. You can also undergo bone grafting to restore your jawbone after you have suffered from trauma. The procedure can build up tissue that is underdeveloped or misshapen because of genetical defects as well. Dr. Osinski also performs alveolar ridge preservation to prevent recession after extraction. Prior to your bone graft, Dr. Osinski will numb the treatment area. Typically, he will also provide a deeper form of sedation, such as intravenous (IV) sedation, nitrous oxide, or oral conscious sedation. Once the medication has taken effect, he may take a sample of bone from another area, such as your chin or hard palate. In other cases, he can use donor tissue or a biocompatible substitute. After creating small incisions in your gums, he can place the new tissue over the recessed areas of your jaw. Tiny metal posts may be used to keep the sample in place. Dr. Osinski can then suture your incisions closed. Healing from a bone graft can take up to six months. During this time, the new tissue will fuse with your existing jaw structure. My Saratoga Dentist PLLC, also uses platelet-rich plasma (PRP) therapy to improve healing. For this process, we will use your own blood to separate and concentrate platelets that contain growth factors to enhance and speed recovery. Dr. Osinski is one of only two percent of dentists in New York with the ability to provide IV sedation. He can keep you safe, comfortable, and relaxed throughout your surgery. A bone graft can enable you to receive dental implants so that you can enjoy a permanently restored smile and dental function. Bone grafting can prevent further jaw recession and future tooth loss. The procedure also allows patients who have suffered from significant trauma or congenital defects to have a proportionate, healthy jaw. In addition, since jaw recession can change your appearance, a graft can protect the natural proportions of your face. When you receive treatment from Dr. Osinski, you will also benefit from his expertise. He has advanced post-graduate training in regenerative grafting and innovative healing treatments. Dr. Osinski is also familiar with the latest digital imaging technologies, and he can use these tools to plan very precise surgeries. Additionally, he is one of only two percent of dentists in New York with the ability to provide IV sedation. He can keep you safe, comfortable, and relaxed throughout your surgery. With a bone graft, you can enjoy a strong, stable, healthy jaw. To learn more about the procedure and to find out how the treatment can benefit you, contact our office today.